This black and chrome easel clamps to table tops, chair backs and many other surfaces, whether vertical, horizontal or angled. 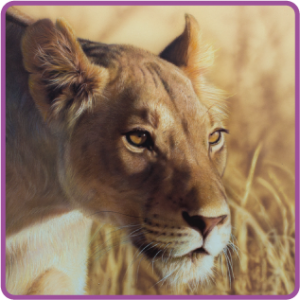 It’s sturdy enough to use for work and attractive enough to use for display. 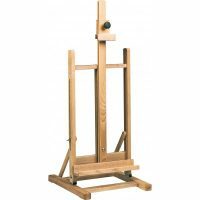 The Clamp on Table Easel by Richeson and Co. is perfect for artists that take their canvas or art board from room to room or location to location. It folds effortlessly to a compact size that makes toting it anywhere you go a breeze. It’s chrome and black finish gives it a modern and stylish appeal. Although it’s portable, this clamp on table easel is sturdy and secure. It holds canvases as large as 29 inches and they can be attached horizontally, vertically and even angled! You don’t need to worry about skidding with this product either, because it has a powerful gripping mechanism. 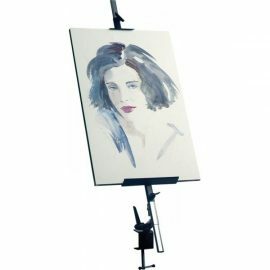 The best features of this easel are that it folds to the size of an umbrella, which means that you can take it anywhere you go. Then once you are there, you can clamp it to just about any surface – a chair, bench, railing, table – and get to work! The Clamp-On Easel holds canvases up to 29-inches tall. 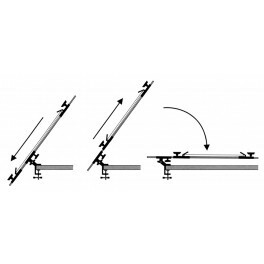 It clamps to table tops, chair-backs, stools, and many other surfaces, whether vertical, horizontal or angled. Clamp it on to your car dashboard, park bench, or to your bike – this easel allows you to be creative anywhere, with the least amount of trouble. When folded, it is as compact as an average umbrella.